Fredericton is the capital of the Canadian province of New Brunswick. Eschew the tourist crowds and head to Officers' Square and Christ Church Cathedral. Kings Landing Historical Settlement and Fredericton Region Museum will appeal to history buffs. Change things up with these side-trips from Fredericton: Mactaquac Golf Course (in Mactaquac) and Maliseet Trail (in Woodstock). The adventure continues: steep yourself in history at Legislative Assembly Building, get a sense of history and politics at Old Government House, sample the tasty concoctions at Picaroons, and get a taste of the local shopping with Gallery 78. To find more things to do, traveler tips, ratings, and tourist information, refer to the Fredericton vacation trip planner. Vancouver to Fredericton is an approximately 9.5-hour flight. You can also drive. Due to the time zone difference, you'll lose 4 hours traveling from Vancouver to Fredericton. In June, daytime highs in Fredericton are 25°C, while nighttime lows are 11°C. On the 22nd (Thu), wrap the sightseeing up by early afternoon so you can travel to Edmundston. Edmundston is a city in Madawaska County, New Brunswick, Canada. Eschew the tourist crowds and head to Zipline and De La Republique Provincial Park. The adventure continues: admire the natural beauty at New Brunswick Botanical Garden, examine the collection at Centre D'Interprétation des Voies Ferrées: Du Réel au Miniature, indulge your thirst for a good beer at Brasseurs du Petit-Sault Brewers, and play a few rounds at Fraser Edmundston Golf Club. To see photos, other places to visit, more things to do, and tourist information, read our Edmundston itinerary maker. Traveling by car from Fredericton to Edmundston takes 3 hours. Traveling from Fredericton in June, plan for a bit cooler nights in Edmundston, with lows around 8°C. Finish your sightseeing early on the 27th (Tue) so you can travel to Caraquet. Caraquet is a town in Gloucester County, New Brunswick, Canada.Situated on the shore of Chaleur Bay in the Acadian Peninsula, its name is derived from the Mi'kmaq term for meeting of two rivers. Popular historic sites such as Miscou Island Lighthouse and Sainte-Anne Du Bocage, Site Religieux catholique are in your itinerary. Step off the beaten path and head to Daly Point Nature Reserve and Promenade Waterfront. 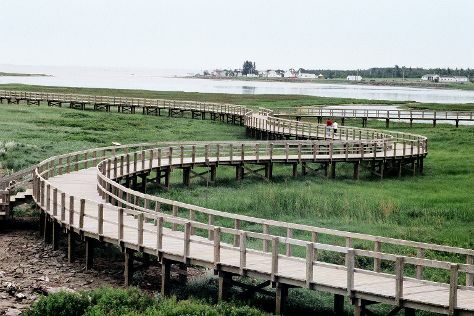 Explore Caraquet's surroundings by going to New Brunswick Aquarium and Marine Centre (in Shippagan), Miscou (Plage Isle Miscou & Miscou Island) and Atlas Park (in Pointe-Verte). For photos, where to stay, traveler tips, and tourist information, refer to the Caraquet custom trip planner. You can drive from Edmundston to Caraquet in 4 hours. Traveling from Edmundston to Caraquet, you'll gain 1 hour due to the time zone difference. While traveling from Edmundston, expect slightly colder days and about the same nights in Caraquet, ranging from highs of 20°C to lows of 9°C. Wrap up your sightseeing on the 3rd (Mon) early enough to travel to Miramichi. 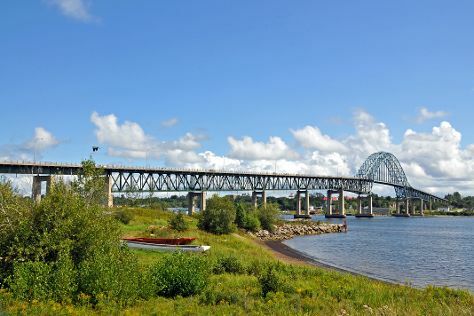 Miramichi is the largest city in northern New Brunswick, Canada. Get outdoors at Miramichi River and Kouchibouguac National Park. Visit French Fort Cove and Metepenagiag Heritage Park for their historical value. There's lots more to do: pause for some serene contemplation at St. Michael's Basilica, look for all kinds of wild species at Hay Island Provincial Park, don't miss a visit to MacDonald Farm Provincial Heritage Place, and take in the waterfront at Ritchie Wharf. For more things to do, ratings, and more tourist information, you can read our Miramichi trip planner. Getting from Caraquet to Miramichi by car takes about 1.5 hours. Due to the time zone difference, you'll lose 1 hour traveling from Caraquet to Miramichi. July in Miramichi sees daily highs of 30°C and lows of 15°C at night. Wrap up your sightseeing by early afternoon on the 8th (Sat) to allow time for travel to Shediac. Shediac is a Canadian town in Westmorland County, New Brunswick. Get outdoors at The Irving Eco-Centre and Murray Beach Provincial Park. Explore hidden gems such as Irishtown Nature Park and Irving Arboretum. You'll find plenty of places to visit near Shediac: Moncton (Magnetic Hill Winery & Mapleton Park). There's still lots to do: enjoy the sand and surf at Parlee Beach Provincial Park and admire nature's wide array of creatures at Ecocentre Homarus Eco-Centre. For reviews, traveler tips, where to stay, and other tourist information, use the Shediac vacation planner. Traveling by car from Miramichi to Shediac takes 1.5 hours. Expect a daytime high around 29°C in July, and nighttime lows around 16°C. Wrap up your sightseeing on the 12th (Wed) early enough to travel to Hopewell Cape. 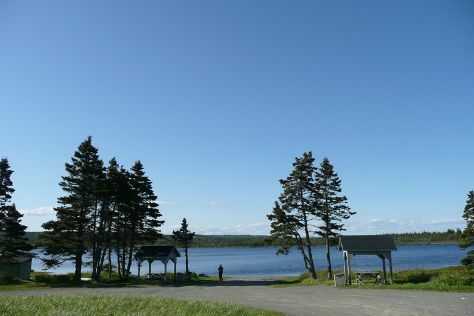 Get in touch with nature at Sackville Waterfowl Park and Cape Enrage. Explore hidden gems such as Albert County Museum and Photography Tours. Change things up with these side-trips from Hopewell Cape: Sackville (Fog Forest Gallery & Framing, Beech Hill Park, & more), Fundy National Park (in Alma) and Waterside (Waterside Beach & Waterside Farms Cottage Winery). To find where to stay, other places to visit, reviews, and other tourist information, go to the Hopewell Cape trip planner. You can drive from Shediac to Hopewell Cape in an hour. Expect a daytime high around 28°C in July, and nighttime lows around 16°C. Wrap up your sightseeing by early afternoon on the 19th (Wed) to allow enough time to travel to Saint John. Step off the beaten path and head to Zipline and Carleton Martello Tower National Historic Site. Get outdoors at New River Beach Provincial Park and Irving Nature Park. Get out of town with these interesting Saint John side-trips: Dunhams Run Estate Winery (in Kingston), St. Martins (Quaco Head Lighthouse & St. Martins Sea Caves) and Gondola Point Beach (in Quispamsis). There's still lots to do: pause for some serene contemplation at Trinity Anglican Church, hike along Harbour Passage, soothe aching muscles at some of the top local wellness centers, and test your team's savvy at popular escape rooms. To see ratings, photos, and other tourist information, use the Saint John custom trip planner. Traveling by car from Hopewell Cape to Saint John takes 2 hours. In July, plan for daily highs up to 27°C, and evening lows to 14°C. Wrap up your sightseeing on the 27th (Thu) early enough to drive to Saint Andrews. Explore hidden gems such as Charlotte County Archives and Pea Point Island Lighthouse. Get some historical perspective at McAdam Railway Station and Green's Point Lighthouse. Take a break from Saint Andrews with a short trip to Kayaking & Canoeing in Deer Island, about 1h 25 min away. There's much more to do: take an in-depth tour of Ross Memorial Museum, look for gifts at Crocker Hill Store, steep yourself in history at St. Andrews Blockhouse National Historic Site, and look for all kinds of wild species at Wild Salmon Nature Centre. To find ratings, traveler tips, maps, and other tourist information, you can read our Saint Andrews vacation trip planner. Getting from Saint John to Saint Andrews by car takes about 1.5 hours. You'll gain 1 hour traveling from Saint John to Saint Andrews due to the time zone difference. In July, daily temperatures in Saint Andrews can reach 28°C, while at night they dip to 17°C. Finish your sightseeing early on the 3rd (Thu) to allow enough time to travel to Campobello Island. Campobello Island is an island located at the entrance to Passamaquoddy Bay, adjacent to the entrance to Cobscook Bay, and within the Bay of Fundy. Visit Mulholland Point Lighthouse and Roosevelt Campobello International Park for their historical value. You'll discover tucked-away gems like Herring Cove Provincial Park and Dolphin & Whale Watching. To see where to stay, traveler tips, maps, and more tourist information, refer to the Campobello Island travel planner. Traveling by car from Saint Andrews to Campobello Island takes 2 hours. Expect a daytime high around 28°C in August, and nighttime lows around 17°C. Finish your sightseeing early on the 7th (Mon) so you can travel to Grand Manan. Grand Manan Island is a Canadian island, and the largest of the Fundy Islands in the Bay of Fundy. Get outdoors at Anchorage Provincial Park and Kayaking & Canoeing. Eschew the tourist crowds and head to Southwest Head Light House and Itty Bitty Barnyard. There's lots more to do: make a trip to Long Eddy Point Lighthouse, stop by The Cheeky Magpie, look for all kinds of wild species at Grand Manan Whale and Seabird Research Station, and take in the exciting artwork at Pettes Cove Arts. For photos, traveler tips, where to stay, and more tourist information, read Grand Manan itinerary builder. Traveling by car from Campobello Island to Grand Manan takes 4 hours. You'll lose 1 hour traveling from Campobello Island to Grand Manan due to the time zone difference. When traveling from Campobello Island in August, plan for slightly colder days in Grand Manan, with highs around 23°C, while nights are about the same with lows around 15°C. On the 11th (Fri), wrap the sightseeing up by early afternoon so you can travel back home.